This restores all the uncut original scenes, as well as the “Swan Song” logos as they were meant to be seen before the film had to be optically modified right before its release due to a lawsuit with Led Zeppelin. My goal was to restore all the uncut original scenes, as well as the “Swan Song” logos as they were meant to be seen before the film had to be optically modified right before its release due to a lawsuit with Led Zeppelin (all the “Swan Song” logos throughout the film had to be replaced with the infamous “dead bird” one, and some scenes had to be trimmed or deleted). The original film material seemed to be lost forever, until the owner of the amazing Swan Archive website acquired some of the original 35mm camera negatives, had them digitized and previewed some of the footage on his website. Thanks to his generosity, I was able to re-edit the film the way it was meant to be seen, and to reinsert the original “PHANTOM” title, as well as the missing gore shot of Winslow escaping the warehouse. Note that despite the digital corrections used, the quality between the film and the extended/unseen bits greatly varies: the newly added parts aren’t perfect due to the source’s quality (10fps .flv files). Therefore, this version of “Phantom” is mostly recommended for completists and fans of this amazing film. I hope you’ll enjoy it! - 35 minutes of unseen footage & alternate takes [mute] taken from the 35mm camera negatives that were recently discovered and shared by the amazing Swan Archive website. 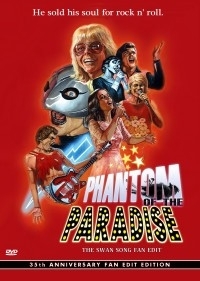 00:01:42 – Original “BRIAN DEPALMA’S PHANTOM” title restored in place of the “Phantom Of The Paradise” one. 00:03:06 – Extended shot of Winslow in front of the Majestic with “Swan Song” title. 00:11:56 – Swan Song title reinserted on the transitory “Death Records” logo. 00:12:10 – Extended shot of Winslow meeting the greasers in the Hallway leading to Swan’s office (mute scene). 00:12:58 – Building plaque at the door of Swan’s building corrected with the original “Swan Song Enterprise” plaque. 00:24:49 – Missing gore shot of Winslow’s face reinserted along with his escape from the warehouse (bad audio). 00:45:54 – Aerodrome scene: All the “Dead Bird” logos have been replaced with the original “Swan Song” logos (shaky at times due to the forced zoom-in). + ALL THE WAY THROUGH: I have replaced the DVD audio mix with the original audio mix from the original US Laserdisc (re-synched and remastered), which is more dynamic and truer to the film’s original version. Beyond great! This is one of my favorite films ever made. This version of the film is a great companion piece to the original DVD. Keep up the good work. Great job! Putting the LD mix over the DVD image was a great touch, it’s too bad there isn’t an NTSC version of the French remaster. One or two things: You missed a few Swan Song overmattes. One is blotted out on the reel to reel tape recorder right before the “Phantom’s Theme” (“To work it out I let Them In…”), there’s a few seconds of the “Dead Bird” Death Logo in the press conference sequence and there’s a tiny Dead Bird below the TV screen during the Swan Soul Selling (in the bathtub) towards the end. They’re the only one’s I noticed that you missed. The flvs were well integrated, though I thought you would’ve used the longer opening to the press conference. All in all, a great reconstruction. I can’t wait to show it to my Phantom friends! All I can say is WOW! This is my all-time favorite film and this is a SUPERB edit. Many thanks for this one, Doc…it is PHANtastic. When the outtakes popped up on the Swan Archives it was a dream come true seeing some of that footage. Never thought I’d get to see something like this put together.